Setting up a water filtering system is be one of the most important health related decisions you can make. Some experts in the field have said that, from a health standpoint, the water you bathe in is more important than the water you drink. The main chemical that has experts concerned is chlorine. Chlorine is an oxidizer which is commonly used to reduce organic matter and disinfect water supplies. Once the water has been disinfected there is no more need for the chemical and prolonged contact can be detrimental. Our Whole Home Filtration Systems have been designed to remove chlorine, contaminants and hardness minerals from the incoming water supply. 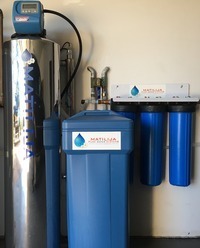 These specially designed systems are cost effective, low maintenance, and an significant addition to the standard water softening technique. 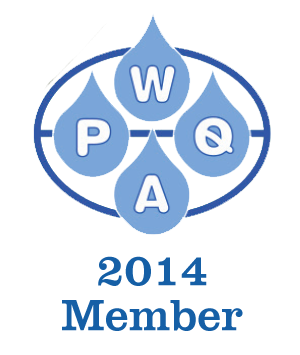 Whether you choose an all-in-one water filtration system, have us augment your existing softener, or design a fully custom home Reverse Osmosis filtration unit, we are here to provide you with state-of-the-art service and equipment. The all-in-one softener for consumers who demand the very best! Our Premium Dual Media Water Conditioners utilize Vortech patented distributor technology to maximize your media efficiency with two separate media chambers in one tank. 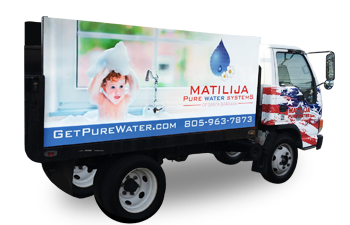 Matilija Salt Free Water Conditioning Systems, there's no salt, no backwash, no scale, no chlorine and no electricity! Ultraviolet (UV) light is a water treatment disinfection technology that is highly effective in killing and inactivating many species of disease-causing micro-organisms. The Blue Filtration Series remove Chloramine, bad taste and odor. Appropriate for a whole home use and light commercial. It does not remove large amounts of mineral sediments. 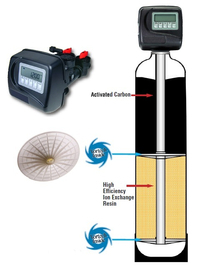 The Green Filtration Series removes large amounts of mineral sediments and bacteria. Appropriate as a 1st level filter for a whole home use and light commercial. It does not remove Chlorine, chemicals or order.